The Whole Kit and Caboodle Thai Veggie Noodle Soup! I know, it’s a long name but I felt it summed up this dish perfectly! 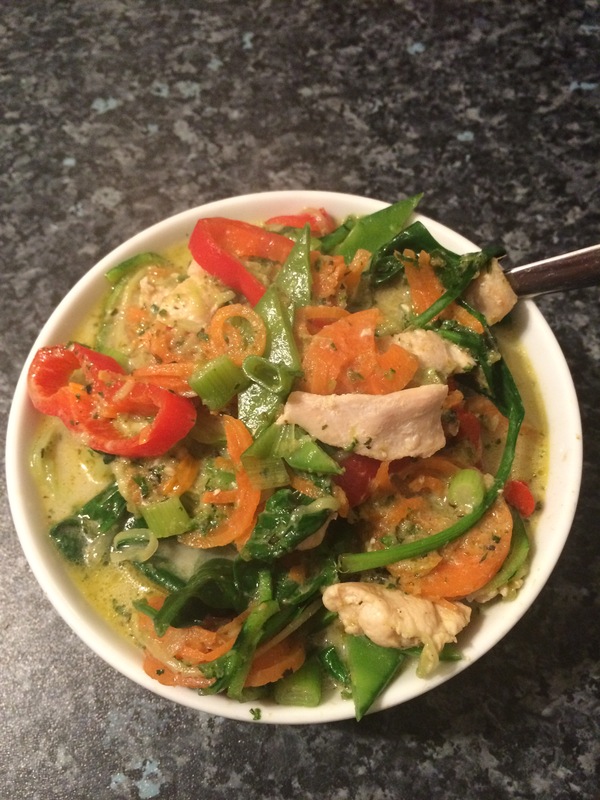 Basically a whole heap of veggies, some nice thai green curry and a whole lot of SLURP! I got a spiraliser and it is so much fun! I like to prep a few veggies at the same time, box them up and refrigerate them for use over the next couple of days. Here I used carrot and courgette as my noodles. You could also serve this dish with rice if you wanted but don’t worry, this dish is plenty filling on its own without the carb! – Heat a spray of oil in a large, deep frying pan. – Add the chicken and the curry paste and cook for 5 minutes, stirring, until the chicken is white all over. – Add the coconut milk powder and water (or the tin of coconut milk). – Bring to a simmer. – Give a good stir around to coat in the sauce.